On Christmas Eve, Ananda Village had its first initiation ceremony for the new Nayaswami renunciate order. Many people took vows at all levels, and you can see photos of the ceremony here. Christmas Eve night began with a 2-hour meditation, and then the service lasted from 10 PM to midnight. The service was like a reinterpretation of our usual Sunday services, customized and restructured for Christmas. So it was fun to experience some of the same elements, but with fresh eyes and ears, as it were, because of the changed context. 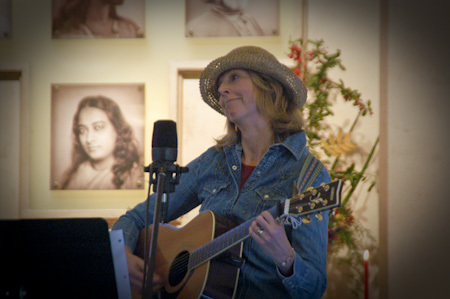 There was a great deal of music, including Christmas carols, and small-ensemble performances of various Oratorio pieces, and other songs by Swami Kriyananda, such as "The Life Mantra." Pavani (formerly Clare) danced to an instrumental version of "O Come All Ye Faithful," after which the congregation sang the verses while various members of "the faithful" came forwarded and offered roses to the baby Jesus on the altar. All of this was worked into an extended version of the Festival of Light, which culminated in a very appropriately festive display of lights. The main area of the temple was dark, with all the light on the stage and altar, but everybody had picked up a small votive candle on their way into service. David and Asha walked down the aisle lighting the votives from their larger candles, and the flame was passed along, candle to candle, down each row until the entire temple was dotted with little flickering lights. Then the entire assembly performed the arati together, offering their lights up to Jesus and the masters. Then we all lined up to receive the blessing from the light-bearers, after which everyone placed their candles on the altar until the entire galaxy of little stars had pooled there around the baby Jesus. The Christmas Day service was specifically very kid- and family-oriented. It was less like a service, and more like Asha narrating a live-action performance of the Christmas story, interspersed with more of Swami's music as well as traditional Christmas songs. 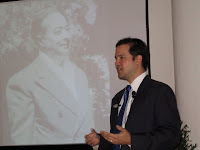 Though targeted at children, the presentation of the story was quite illuminating from an adult's perspective, as well. This service also had its own version of the Festival of Light, though considerably abbreviated in this case. By the end of the story, the stage was covered with angels and wise men (of all ages), surrounding the holy family. The audience was then invited to come up and pay their own respects to the baby Jesus. In the process, if you crouched down far enough, various of the smaller angels and wise men would shower you with glitter and confetti blessings. Some of the taller ones were light-bearers in disguise, and offered the more usual blessing with candles. It was a delightful combination. See more photos of Christmas day from Suman and Karen. This weekend contained two Christmas events that were utterly delightful in completely different ways. 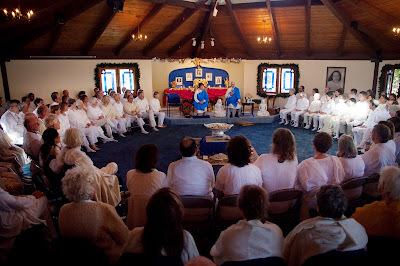 On Saturday we had the all-day Christmas meditation. The eight hours spent at the sangha were well balanced, with enough breaks to keep everyone comfortable and energized, and enough meditation to stay focused and internalized. One special treat was the showing of a 15-minute clip from the documentary of Swami Kriyananda that's being made in Italy, which looks like it's just going to be a gem. But, of course, the real joy of the day was meditating that intensely with so many great souls. From the minute I sat down, I felt like I was simply joining a flow of energy that was there waiting for me, and that carried us all along with Jesus' and Yogananda's blessings. It was a true celebration of what Master called "Spiritual Christmas." Then on Sunday night we directed our energy outward, when 20 or so people launched from Chela Bhavan to spread Christmas caroling cheer all around the Monroe Drive loop. Asha had her bike, and would dash on ahead to figure out where we'd sing next, and then come back to direct us there. Then a crowd of singers and guitarists would pile onto and around the appropriate porch and unleash a joyful noise at the residents. Along with the usual Christmas favorites, we also had such extra bonuses as a verse of "The First Noel" naming Sri Yukteswar, Lahiri, and Babaji as the three wise men, and Matthew's rendition of "O Come All Ye Faithful" in Italian. Four or five households passed around cookies after we sang (including some excellent Swedish ginger snaps), and we left a little trail of happy smiles and cookie crumbs in our wake as we went. We came home to the community with two of Swamiji's songs. At the nativity scene by the driveway entrance we sang "The Christ Child's Asleep" to Jesus, Joseph and Mary. Then we moved on to Yogananda's gazebo to sing "The Christmas Mystery." That was a beautiful way to pull the joy back inside, before reconvening at Chela Bhavan for potlucking and satsang. Quite a lovely weekend, all around. 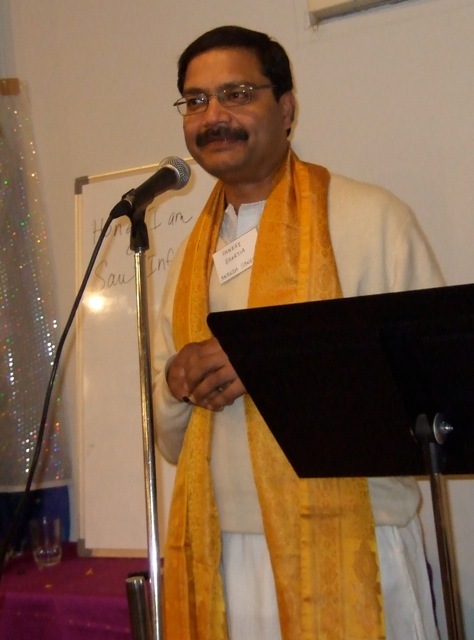 Nayaswamis Hriman and Padma McGilloway, of the Seattle community, have posted a letter and some photographs on their blog, describing their experience of joining the new Nayaswami order. Their perspective compliments Asha's letter nicely, and is well worth a read. 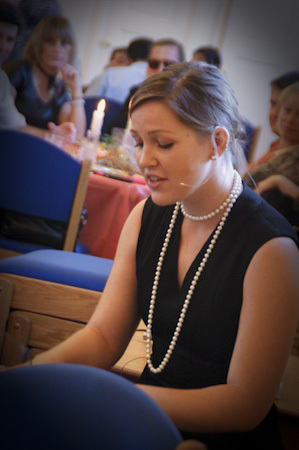 The Skillmans kindly sent some photos of Friday's Oratorio performance. (Thanks!) You can see them here. Friday night saw the choir's performance of Swamiji's oratorio, Christ Lives. 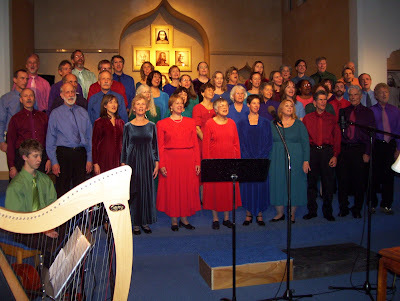 The Palo Alto choir was joined by various folks from the Village, including Ben on cello, Bhagavati on flute and singing alto, and Ramesha singing tenor. I'm surely missing others. It was a huge group — people just seem to come out of the woodwork for the Oratorio — and it was marvelous to get to sing in the middle of it. I'm hoping it was at least half as much fun for the audience as for the performers, and judging from the comments I heard, it was a very powerful experience all around. Shanti observed that a lot of the singers, especially the soloists, did an excellent job of conveying the meaning of the songs with their faces, and not only through the words. (And, as Dambara put it, singing is about communication, after all.) Visiting audience-member Betty Lue remarked that "there was more Truth in this telling of the story" than you usually hear or feel in other renditions of it. For myself personally, this was my first experience singing in the Oratorio, and as soon as it was done I was ready to do it again. As many of you know, I went to Medjugorie recently. This little village is in Bosnia-Herzegovina. It is where the Madonna appeared to six children in 1981, and has been appearing to most of them ever since. I have always wanted to go to places where the Divine Mother aspect of God is especially manifested. I went with Nandini, who had been there before and "knew the ropes," and with Miriam, who for some years has been my nurse. I can't imagine better companions for such a trip. In going, I was not interested in the intellectual or dogmatic aspects of the scene there. I know that Catholics think of Mary as only the mother of Jesus Christ. At Medjugorie, however, the Madonna has repeatedly told the visionaries that all humanity are her children, and that She is above all sectarian differences, even between religion and religion. And I ask, Before the birth of either Mary or Jesus, was there no Mother? Of course there was! And at Medjugorie She makes it very clear that that is who She really is. I wore my nayaswami robe throughout my stay there, and felt completely comfortable in it. Everywhere I went, people respected it without question. It also helped me to get inside places from which others were excluded. Vicka (pronounced Vitska) is perhaps the main visionary, though I'm not quite sure of the distinctions. She hasn't been seeing people for many months -- perhaps for three years -- owing to great pains she is suffering in her spine. Much of her time seems to be spent in Zagreb (where, incidentally, my father was being transferred from Bucharest when World War II broke out). We were fortunate to see her at her home on what seems to have been the only day she came back there. I think we were the only ones who got to see her -- maybe in months. And, as far as I know, millions go to Medjugorie every year. We were fortunate to arrive in the village during a very quiet time; most of the pilgrims would be arriving for December 8th, the Festival of the Madonna, and later again for Christmas. I have to say that the visit to Vicka was the highlight of our visit. She spent quite a bit of time with us, was extremely loving. Her husband, Mario, asked me privately for a blessing, and both of them were an inspiration to be with. I asked Vicka if she would ask the Divine Mother for me whether there was anything more I could do for Her in this life. I told her I've been serving Her for over sixty-one years, and have done nearly everything I can think of in this service. She promised to ask that question. So far, I've had no outward answer from her, but I returned from Medjugorie with what I feel is Divine Mother's answer: "Love me ever more deeply, in your heart." And sometimes, even more so since my visit there, I feel so much bliss in my heart, I can hardly bear it! Marjana (pronounced Maryana) had a "visitation" in her home on the second. I was allowed inside, despite the crowd, and sat hardly two yards from her. I had my eyes closed throughout, however, feeling great bliss. It wouldn't really have mattered where they put me. The next day (I think it was) she had a public meeting outside her home. Again, I was allowed in the courtyard, though almost everyone else had to stand outside. When she came out, she came straight over to me and shook my hand. I found her extremely clear minded and intelligent -- really, a joy to listen to. There was quite a bit of emphasis on everyone going to confession, to mass, fasting, and reciting the rosary every day. Catholic stuff, beautiful in its own way, but things that we translate into other terms. Confession, to us, means opening our hearts with complete honesty to God, and to one who we really feel can help us. Mass, to us, means inner communion. The rosary was beautiful in its way, but I found all that outwardness a little distracting. When people recited, "Pray for us sinners," I substituted the words, "Pray for us, who love You." Why keep on affirming our sinfulness?! When Marjana spoke of listening to the priests, she used the word pastors, which seemed to me deliberate, and more suitable. I was extremely well impressed with her. We also went to the home of a lady called Nancy, who has built what she calls an outward replica of St. Teresa of Avila's "Interior Castle." This lady also spoke beautifully, with deep inspiration, though I thought she sounded the note too heavily of submission and obedience to the priests. I couldn't help remembering the words of St. Odo of Cluny, "The floors of hell are paved with the bald pates of clergymen"! We went to an institution, called the Cenacolo, which rescues drug addicts and the like. A very noble enterprise. And we also went to a place where music is composed and sung, some of it beautiful and inspiring. I was taken up Apparition Hill in a chair by a group of young men from the Cenacolo. A wonderful experience. The way was so very rocky that even Miriam had a hard time coming down it. The weather was mostly very rainy, windy, and cold. But even so, the trip was very inspiring. Have I covered everything? Probably not, but I hope I've given you at least a flavor of what was, really, a high point in my life. 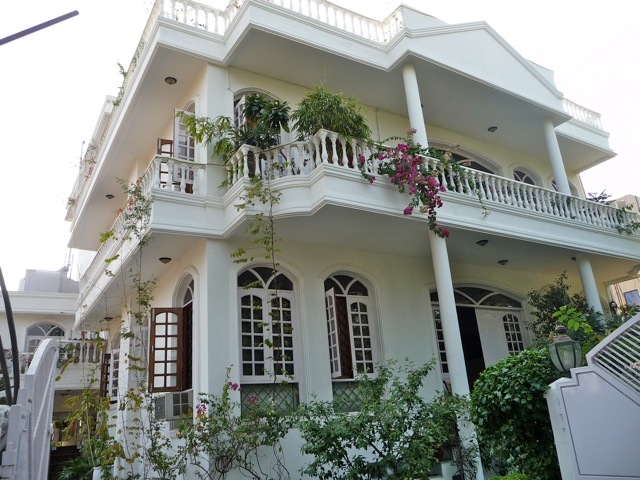 Greetings from Ananda India! We just celebrated our six year anniversary! It's hard to believe it's already been six years since Swami Kriyananda and a few helpers came to Gurgaon to start Ananda's work in India. Here are some details of a report on "Accomplishments in 2009" that was presented at the celebration. The most dramatic development this year is how, just one year ago, our staff divided in two, with Swamiji and half the group moving to Pune to develop the new Kriya Yoga Community on 30 acres of land. In the next 2-3 months the first buildings are getting occupied, and gardens and orchards have been planted. Swamiji expects to move to his new house there in January or February. Almost as dramatic has been the transformation of our outreach and of our teaching staff in the Delhi area. Shivani and Jayadev from Ananda Assisi offered meditation teacher training and yoga teacher training courses for first time in India this year—starting with 3-day intensives, and continuing with monthly workshops and lots of in-the-field experience. 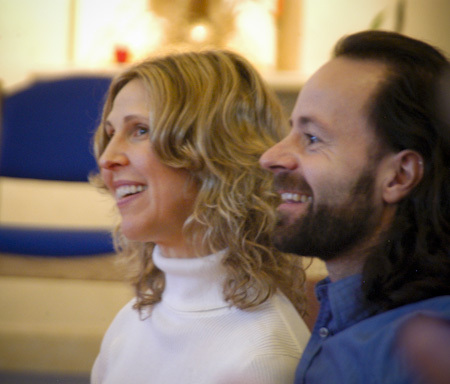 12 new meditation teachers and 11 yoga teachers are continuing this training. The majority of our teachers are now Indian, teaching also in Hindi. Under the inspiration of Dhyana, many more classes, and many new classes are taking place, similar in variety to what our US colonies offer. 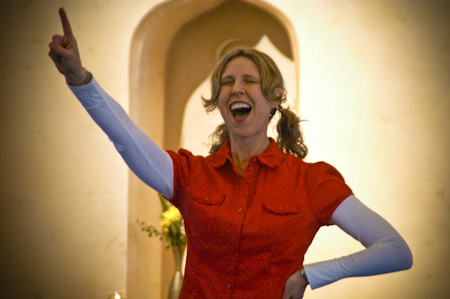 There is a dynamic music sangha, led by Dharmini, and a healing prayer sangha. Our first Spiritual Renewal Weekend was a great experience, and we'll repeat it next year. 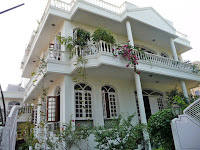 Our main ashram building in Gurgaon used to be known as just a place where several Western teachers lived. In the last year it has been transformed into a dynamic spiritual center with public activities every day. 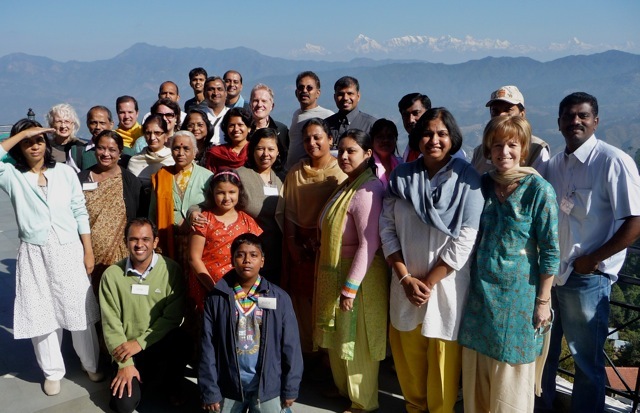 Most of the ashram residents are Indian. The Westerners in Gurgaon are presently Dhyana, Pat Kirby, Cecilia, Haridas and Roma, Keshava and Daya, Dharmaraj and Dharmini, and Priya McDivitt. There is also much more involvement and commitment by Sangha members, Kriyabans, and disciples—both here and in other cities. Ever more volunteers serve many hours every week. More people are supporting the work financially, through donations and tithing. Half of our choir is Indian. Several families and Sangha teachers have moved to live closer to the Gurgaon ashram, and can now take part fully in activities here. About 1000 people learned to meditate with Ananda Sangha this year, at 5 locations around Delhi—as well as Lucknow, Kolkata, Bangalore, Pune, and Mumbai. We've had 9 Kriya Initiations with 100 new Kriyabans this year. Ananda Sangha Publications, managed by Sangeeta, has published 9 new book titles this year, to make a total of 37 new titles in the last 6 years. Though only a small fraction of India's population reads English books, sales of Sangha books have gone very well, including a total of 16,000 copies sold of Autobiography of a Yogi, and 10,000 copies of The Essence of the Bhagavad Gita. New developments with outreach and support include Dharmini completely re-designing our website (coming soon), benefitting from the new Ananda Worldwide website which has become very popular. We've also started using Facebook and other ways to keep more in touch. Support to our now 1400 members is also given through monthly Sangha letters, Kriyaban letters, and—in the works—an on-line course in meditation. 100 people went on Ananda Pilgrimages so far this year, to Maharashtra, Ananda California, Ladakh, and Babaji's Cave. Coming up are trips to Kolkata in December, including Kriya Initiation at Master’s house; Rishikesh in February; Ladakh in April; and both Gangotri (source of the Ganges) and Babaji's cave in October (that trip is also suitable for Westerners). Our Dihika Living Wisdom School has manifested this year. The schedule for opening has been a more gradual one, due to construction delays. But that time has been needed in other areas, including integrating the Education for Life curriculum with Indian legal requirements and culture. Of the staff of 5 teachers, 2 are EFL trained, and 3 are being trained with Usha's online classes. The new building's offices, reception area and 2 classrooms are finished and being used; and the staff is marketing and preparing for the start of the school year in March. The Wishing Tree, book & gift shop and point of outreach at Gurgaon's Metropolitan Mall. Vijay Sachdeva devotes more than full time to this. 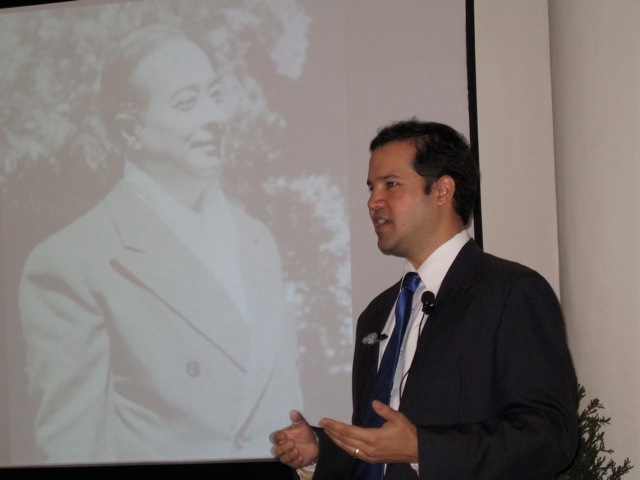 Harmony at Work, which presents these teachings as seminars in corporations. This is the main focus for Dharmaraj and Haridas. Yogananda's Flower Essences, for self-healing, based on the spiritual qualities of foods. Shallu Magotra, who also manages our accounting, took over this business from Claudio and Anjali (Deborah) who recently moved back to Ananda Assisi to serve there. Anjali Khadi, run by Cecilia and her husband, Vivek, employs many village women making products marketed in Europe, including clothes of handloom organic cotton and silk, and cushions and shawls of 'ahimsa' silk (the silkworm doesn't get killed!). In India there is now a huge migration from villages to cities for employment. In a small way, Anjali Khadi gives people viable employment in their own villages. 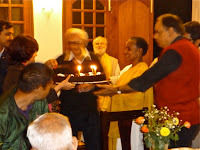 On Master's birthday, January 5, 2010, several of us here will have the great blessing of taking vows with Swamiji, and joining the new renunciate order. We would be eternally grateful for your prayers and well wishes. All of us here wish you a very joyful and inspiring holiday season. 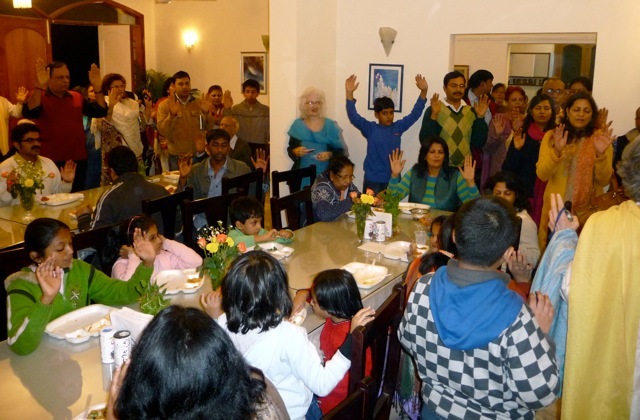 Thanksgiving morning at the sangha started off with a service, led by Nirmoha. It was kind of like a nice mix of Sunday service, a kirtan, and group meditation. That is, we had some readings and a talk, but also more chanting, and longer periods of meditation. It was a good balance. And after the service, of course, came the eating. We pushed aside the chairs, set up tables right there in the temple, and brought out the food. I didn't hear an official count, but I think we had at least 100 people there, which made a very happy-sized crowd. I would list out the menu for you, but that job has already been incomparably done by others. Todd, Patrick, Dambara, and Nirmoha formed a barbershop quartet and sang their own renditions of "Wait Till the Sun Shines, Nelly," and "Sweet Adeline," with the words rewritten to provide us with a menu. So I'm just going to give you those lyrics right here. "We must stay home, Joe," she cried. It's a shame it rained today." With nut loaf and pumpkin pie! 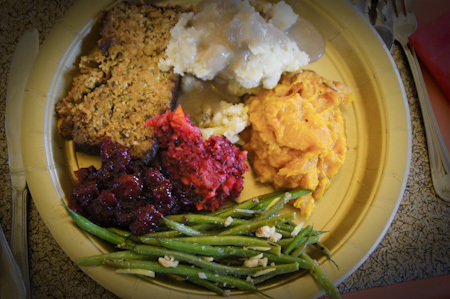 Cranberry sauce on the side. Bye and bye (yes bye and bye)." One thing that didn't make it into the song was a pumpkin pie cheesecake. I'd never had that before, but wow -- brilliant. In addition to the barbershop fun, we had even more delightful entertainment. Lauri and Julie sang "I'm Just a Girl Who Can't Say Om" (though she managed to in the end). Todd played Swami's "The Divine Romance" on piano. Patrick's daughter Leiya sang a beautiful original song of her own about a selkie. 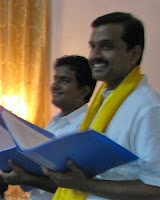 And Dambara and Mary Ellen sang two songs with lyrics by Shakespeare and music by Swamiji. Absolutely wonderful, all around.